Often, sit-at-home moms complain about not getting the opportunity to jog when they have a child at home. The Best Double Jogging Strollers are for parents who want to enjoy a morning or evening stroll along with their babies, in parks or playgrounds; be it even or uneven surfaces. They are also for anyone who just wants to exercise while keeping an eye on their baby relaxing in front of them. The products generally have large inflatable rubber tires instead of plastic wheels, which help them glide smoothly on rough surfaces. Some of these jogging strollers have the option of locking the swivel-front wheel for easy maneuverability through parks, city streets, and other tight spots. 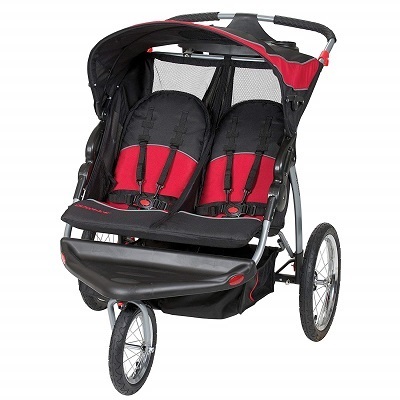 Here are some of the Best Double Jogging Strollers. 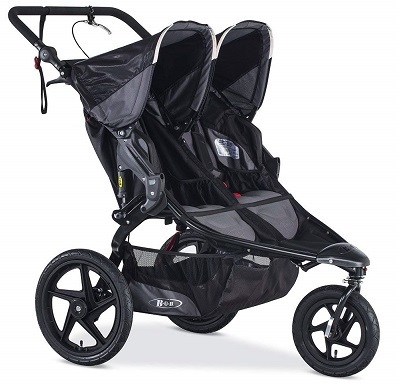 If parents are likely to use boardwalks, beaches or trails, then there is no match for the BOB Revolution Flex Duallie Jogging Stroller, which comes in Black. A regular stroller might bounce and make it a bumpy ride for the child while the parent is jogging. To combat this problem, this Jogging Stroller has rear drum brakes that can be hand activated for maximum control on downhill slopes. It also has a locking facility for the swivel-front wheel, which helps the parent maneuver it easily through rough surfaces. The product is an all-terrain jogging stroller for two children. 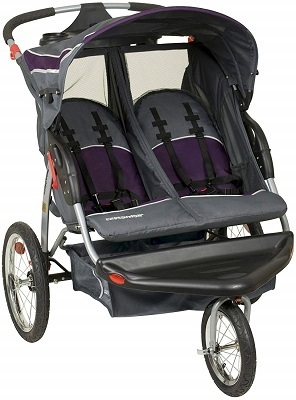 It has excellent ventilation and an extra-large seat with a UPF 50+ canopy. It has a facility where you can comfortably store all the supplies. An oversized cargo basket underneath the seat is a significant advantage. The front wheel can be swiveled for maneuverability, or it can be locked for added stability. Its adjustable suspension system takes care of the bumps during strides. It has a BOB B-Safe 35 Infant Car Seat by Britax, which gives you the best travel system to suit your lifestyle. The adjustable handlebar has 9 positions, which means that it can accommodate people of varying heights. On the one hand, its one-hand near-flat recline can accommodate your sleeping children; on the other hand, its fully upright seating position lets them see the world unfurling ahead. This Jogging Stroller can be used from birth up to 50 pounds per seat, which might pose a problem if both the children are plump. The fabric of the canopy and hood flaps is thin. This sophisticated Jogging stroller offers a smooth ride whether it’s on the road or off it, at a reasonable price. On the whole, for my 3 year old child, I found it to be quite useful. It gives him a smooth and comfortable ride, while I jog all the way. 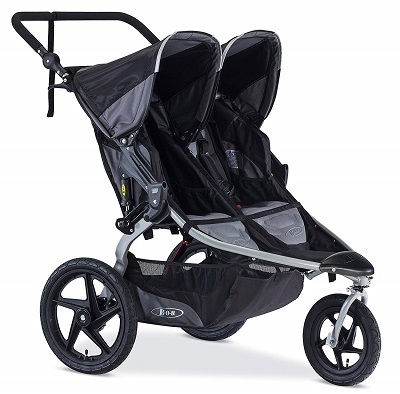 If you are looking for a ride in both plain and rough surfaces, then the BOB Revolution Pro Duallie Jogging Stroller (Black) will give you the value for your money. It has a state-of-the-art adjustable suspension system which easily negotiates bumps while the adjustable handlebar is a perfect fit for every parent. Air-filled tires and a mountain bike-style suspension system will offer you an ultra-smooth ride. A well ventilated, extra-large UPF 50+ canopy and a padded seat ensures a relaxed and comfortable journey for the child. It will swivel with ease while taking tight turns and can be locked forward for increased stability when jogging on rough terrain. It’s perfect for intense workouts and leisurely strolls around the city. Its canopies are not sturdy. It can accommodate only one infant in the car seat unless an infant car seat adapter is used. The seats do not go “fully” upright which could be a little uncomfortable for the child. It is ideal for multiple situations – be it jogging through parks, city streets, boardwalks, beaches or trails. On downhill slopes, especially when you are picking up speed or have hit some hillock, your little ones will be safe, because it has hand-activated rear drum brakes which provide maximum control. This travel system ready jogging stroller is compatible with BOB infant car seats or Britax when using the BOB Duallie Infant Car Seat Adapter sold separately. It also provides 9 positions so that parents of all heights feel comfortable while jogging. 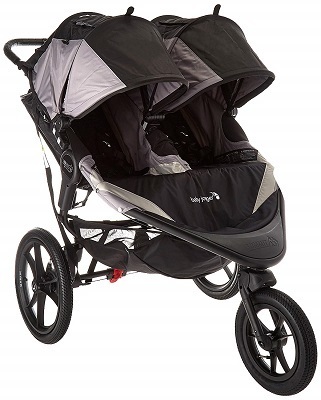 Baby Trend Expedition Double Jogger Stroller is lightweight, but has some excellent features – like durable all-terrain pneumatic rubber bicycle tires which provide comfort and safety to children in multiple scenarios; whether you’re moving around the city or jogging in a park. Multi-position seat recline with a 5-point safety harness. A foot-activated rear brake for the quick and easy stoppage, freeing your hands. It is designed for children aged 6 months and above (50 lbs, each child) and no more than 42″ tall. Therefore, for one-month old infants, this may not be an ideal jogger accessory. This double jogging stroller is not available with car seats. This is a two-seater jogging stroller which comfortably seats two children, each up to 50 lbs, making your job as a parent easier, especially when taking twins or close siblings along on daily activities. It has some excellent features like a large storage basket, a covered storage compartment and a parent tray with 2 cup holders. It can also be used as a regular outing stroller. 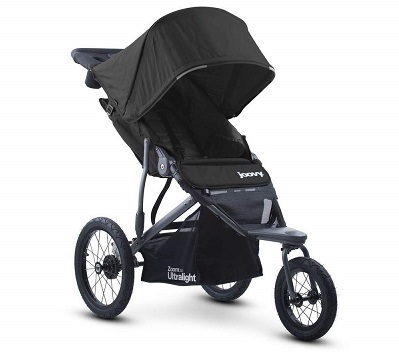 If you are looking for a lightweight Jogging stroller, then the Joovy Zoom 360 Ultralight Jogging Stroller, which comes in black, is probably the best. It is light, simple, durable and performs well, which helps during long-distance strolls with the baby. The addition of a straight rear axle, a graphite colored aluminum frame, and black rims gives it high-end design and functionality. The child will have great visibility while seated in the high riding seat. Its sturdy, comfortable and supportive seat has generous mesh pockets for snacks and take-along. It is incredibly compact, folds easily and has an auto-lock feature; ideal for a true jogger. Its design is a little awkward and is suitable for only one child. Car seat adapters have to be bought separately. It has no handbrakes, though it has a footbrake. Though it is cheaper than other high-end jogging strollers, it still glides and steers easily, even on rough surfaces. This Jogging Stroller is your safety net. Though does not offer a snack tray option, its interior mesh pockets are suitable for small snacks and closed lid drinks. Moreover, it offers excellent sun protection and is easy to assemble. The Baby Trend Double Jogger in Elixer is an excellent product for those parents who would like to carry their twins along, while jogging or whose children are separated by a small age difference or those want to use it for children of similar ages. It is highly recommended for children who are at least 6 months of age and weigh up to 50 lbs. It has a front swivel which can be locked wheel makes maneuvering much more manageable. It has pneumatic bicycle tires. It has a ratcheting shade canopy which provides comfort and shade. It has a parent tray which has two cup holders and a canopied storage arrangement. It has a five-point safety harness which will keep children secure on the go. This stroller does not have the option to hook a child’s tray on to it. Its handlebar is not adjustable. Since it has a side-by-side seat arrangement, it may be difficult to fit it through standard doors. Since it is has a side-by-seat, it allows children to be in intimate contact with each other during the jogging experience. It can be used easily in airports, lawns and in beaches full of sand. The seats recline separately from each other, giving individual mobility to each child. If parents want to explore terrains with a newborn, then the Baby Jogger 2016 Summit X3 Double Jogging Stroller (available in Black/Gray shades) is one of the best options. It has an independent all-wheel suspension that offers high maneuverability and the smoothest of rides. Hand operated rear brakes provide maximum control on hilly and uneven terrains. An all-wheel suspension system and all-terrain tires absorb road bumps. Its UV 50+ sun canopy offers a lot of shade on sunny days. It locks while jogging and unlocks for walking. It lacks a car seat adapter to be used with the stroller. It has a peek-a-boo window, which can be adjusted to multiple positions as you open or close it. This helps you quietly check on your little ones while on the move. This stroller is very smooth and easy to push. It is also suitable for people of above average height. I use this product while flying alone with kids, as it is effortless to fold. It is vital that your children remain safe while you jog your way around. These products not only help you keep fit, but also assist in taking care of the essential needs of your children – giving them a relaxed and comfortable ride. These simple devices are pocket-friendly and can be purchased from Amazon.com at reasonable prices without much hassle. They are much better than cheap double jogging strollers available in local markets. They are worth every single penny!